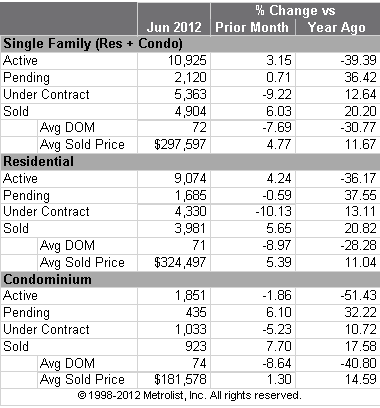 The data below is a snapshot in time of the Denver Area Real Estate Market as of June 2012. The source is the Realtor’s database, Metrolist. It is important to remember, whether buying or selling a home, that “All of Real Estate is Local”. You may be hearing on the national news that this is a buyer’s market or that it is a bad time to sell. But the chart below shows that the opposite may be true for people living in the Denver Metro Area. For example, June’s data shows that prices are rising (Avg Sold Price), the supply of homes that are for sale (number of “Actives”) is falling, and homes are being sold much more quickly (DOM- Days on Market is getting smaller) than this time last year. If the trend continues, Buyers may find it more and more difficult to find a home in their price range, and when they find the home they want to buy, they would need to act more quickly to get the home under contract before someone else does. For Sellers, this data is encouraging, in that the law of Supply & Demand dictates that demand for homes rises as the supply dwindles. As a result, the home may sell faster and for a higher price than it would have last year. Good news for Sellers, maybe not so good for Buyers that decide to “wait to buy” or who procrastinate in moving forward when they see a house that they like. For further information on how the market effects your ability to buy or sell a home in the Denver Area contact me at joan@joanbagwell.com. I can help you understand the market and the challenges you may be facing, and help you put that knowledge to use in making your next move a success. This entry was posted in Real Estate Market & Stats on September 24, 2012 by joanbagwell.